Cato was our first DK and the reason that we fell in love with the Kurzhaars. He was a happy go lucky dog with a spirit that was infectious and a joy to be around. 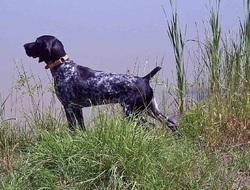 Cato was at home in the field and the water, possessed a fine nose and was an excellent blood tracker. Cato became ill this summer and had to be put down. It was a very painful loss and he is sorely missed.